I try and keep in track of the hotlinks to this site from other blogs. A while back, I noticed a link from a little-used community blog for Ithaca’s Lower Northside, aptly named lowernorthside.org. I decide to check it out, and stumbled upon a map it had included in one of its (few) posts. It’s an atlas of the Ithaca area dating from 1866. When Cornell U. was still a dream under construction, and Ithaca had yet to be incorporated as a city (something that wouldn’t happen until 1888). A lot has changed in 128 years, and it’s really a fascinating look back on an older incarnation of the city of gorges. Clicking on the image will pull up the fine print, or just follow the link above. Unfortunately, the commercial version of wordpress this blog uses doesn’t allow for embedded PDFs, otherwise I’d have cut out the extra step. Of course, for the sake of following along, here’s a map of the current-ish city of Ithaca. 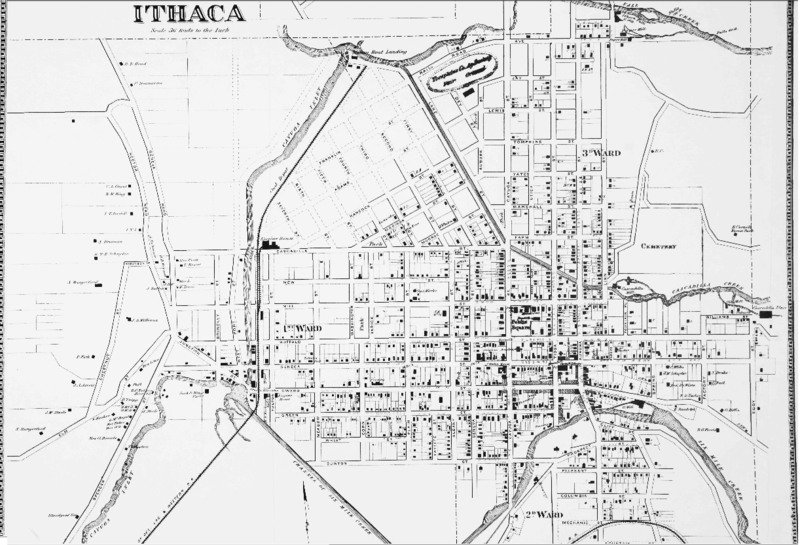 In 1866, Ithaca was much smaller, posting a population in 1870 of 8,462, a number that probably had a bit of help from the newly opened Cornell U. and its 400 or so students. Tompkins county was only one-third of its present population, with about 33,000 people. The county had seen a massive population decline in the 1850s and was only just beginning to recover during this decade. 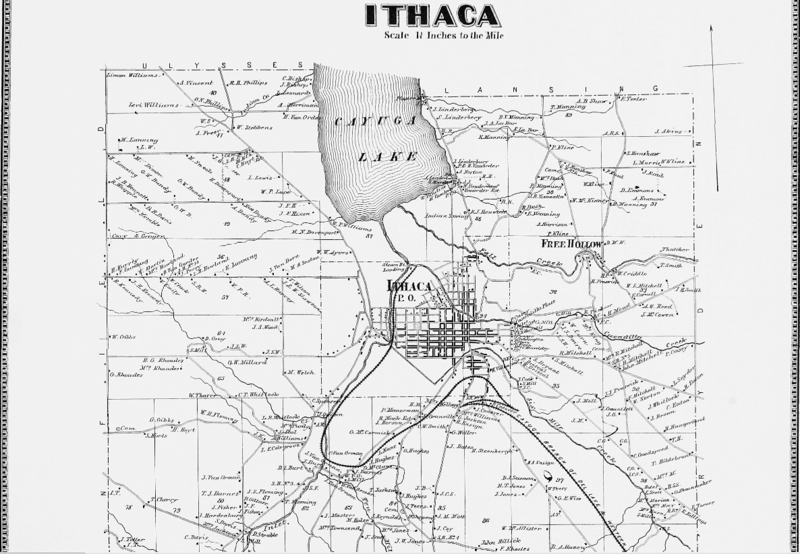 Ithaca was, as today, “centrally isolated”, having been bypassed for a major railroad in favor of Syracuse. However, the Cayuga branch of the Delaware, Lackawanna and Western railroad had its terminus in the city, and there were steamboats one could take down Cayuga if they were coming out of the north. Ithaca was still expanding in all directions, yet to fill out Fall Creek or the Northside, and barely reaching where Collegetown is today. The small hamlet of Forest Home was still known by its original name, Free Hollow, and at the cruxes of dirt roads, small clusters of houses, churches, and small schoolhouses can be seen. 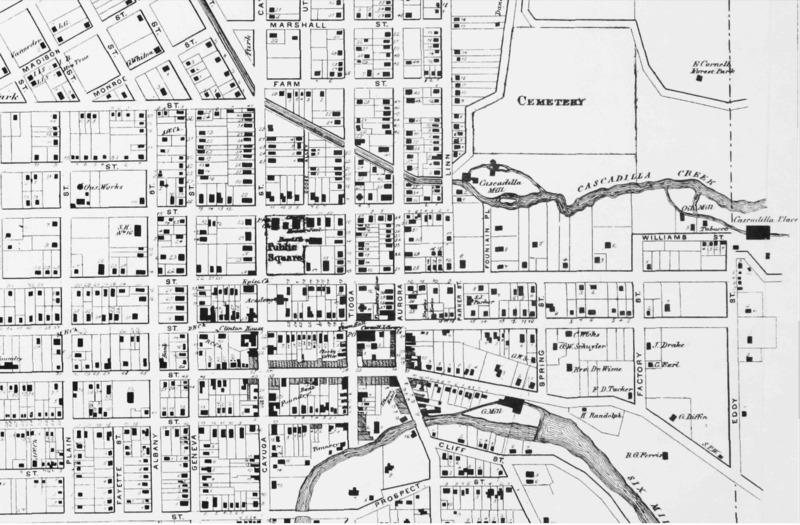 A nice asset here is the inclusion of homeowners’ names; we see names that still live on as place and street names in Ithaca today, like Bryant (Park neighborhood), Coddington (Road), Renwick (Place/Drive/Heights Road), and Mitchell (Street). Ezra’s land is nearly vacant except for his own home, his farmland having but a few roads; and IC and South Hill are barer still. Cascadilla Place is there, completing construction the year this map was made; the water-cure sanitarium was never used as such since Ezra Cornell, its biggest investor, swooped in and repurposed the structure. Another notable name on the larger map, though perhaps not as important today, is Heustis. College Avenue used to be called Heustis Street, after landowner Lorenzo Heustis. The name was changed at the urging of local property owners in 1908. Similarly, Collegetown’s Linden Street, not yet in existence but forthcoming, had to beg the city and line their road with linden trees to get their name change from Hazen Street approved in 1924. Looking a little closer at Ithaca itself, a little re-orienting is required in some neighborhoods. The county fairgrounds were north of the city on Railroad Avenue (now Lincoln Street), in what is today a mostly residential area. No King or Queen Streets yet in Fall Creek, then a sparsely populated if growing neighborhood. Steamboats had their dock near where 13 passes the Sciencenter today. Llenroc (then “Forest Park”) shows up here near the cemetery, the grandiose mansion in the midst of construction in 1866, nine years from completion. Other streets had different names as well; among them, Park Place was Varick Street (for Richard Varick DeWitt, local landowner; also an infinitely cooler name than a Monopoly space), Hillview Place was Mechanic Street, Esty Street was New Street, Cleveland Avenue was Wheat Street, and Court Street was Mill Street (residents despised it so much it was changed to Finch Street, then Court Street in 1924). Most prominently, State Street went by Owego Street at the time (the name change would come next year, in 1867). The contemporary Ithacan asking for directions might get a little confused. Some noted landmarks still stand – the Clinton House (1829), and the old County Courthouse (1854) on the public square. Others have seen the wrecking ball, some not all too long ago – the Cornell Library, brand new in 1866, made it to 1960, the old city hall to 1966. Urban renewal took its toll on the city, though perhaps not as extreme as Albany or Syracuse. The area that would become the Commons is already dense with buildings, though it steadily tapers in any direction and peters out after several blocks. Collegetown is hardly Collegetown, with only a few homes on Spring Street (Schuyler Place, 1924), Factory Street (Stewart Avenue, 1888), and Eddy Street. A tobacco barn, grist and cotton mills, and foundries provided local employment, as well as brewery just south of the current-day police station. Ithaca was a growing large town in upstate New York, with small industries and a developing core. I’ve heard students derisively say that without Cornell (and presumably IC), Ithaca would be as small and unimportant as Watkins Glen. I think that’s an extreme judgement. Maybe Cortland-sized, or maybe it would have ended up like Elmira; but there was a village here before there was a university here, a village that is fascinating to examine on an old map.